A MODERN TANKER built for the Anglo-Saxon Petroleum Co Ltd, the Anadara 8,009 tons gross, was built in 1935 by Harland and Wolff at Glasgow. She is 465 feet long, with a beam of 59 ft 5 in and a depth of 33 ft 10 in. Her eight-cylinder diesel engines of about 3,000 hp is placed well aft and her hull is built with longitudinal framing except at the extreme ends. 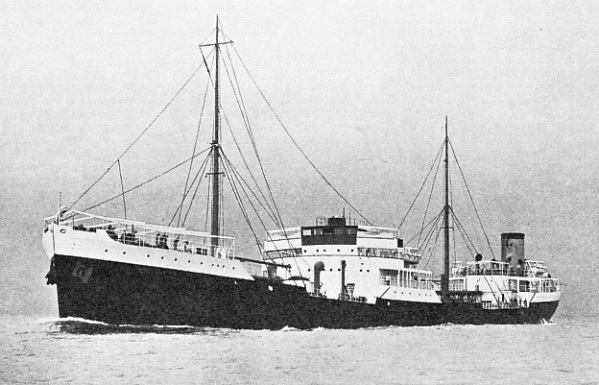 A long, low-waisted, dark-hulled ship, with machinery aft, the typical oil-tanker has a navigating house amidships, two masts and one or two pairs of tall ventilators. The oil-tanker may generally be distinguished by the thin spidery fore-and-aft gangways connecting respectively the forecastle to the navigating structure and the navigating structure to the poop. Although these tankers are trim, clean ships, they are the hardest-worked ships in the world. After a 3,000-miles voyage from Curayao (Dutch West Indies) to Thameshaven an oil-tanker, laden with 10,000 tons of crude oil, may remain in port only for twenty-four hours before she sails again across the Western Ocean on another voyage. A trip from the Antarctic with whale oil to Rotterdam, for example, may be followed by a transatlantic run, prolonged through the Panama Canal to Los Angeles. The tanker’s crew is well paid and the conditions are good, apart from the orders against smoking and the ever-present smell of crude oil or of gasoline. The only time the tanker stays more than forty-eight hours in port is when she is docked for overhaul. According to the returns of Lloyd’s Register of Shipping, the total tonnage of oil tanker vessels increased from just over 1,478,988 gross tons in 1914 to over 9,000,000 gross tons in 1935. This development has been parallel to the increase in the use of oil for all domestic, industrial and marine purposes. Such a development shows the importance of the oil-tanker to-day on the world’s trade routes. This position was not arrived at without a vast amount of experiment and research. Many difficulties are involved in the shipment of some 10,000 tons of liquid in one hull for distances varying from 300 to 3,000 miles. This bulk, too, must be propelled at a speed of at least 10½ knots in all weathers. The problems are the same in principle, although varying in detail for all the three main types of oil cargo. Crude oil, a thick oil straight from the wells, has the consistency of treacle in cold weather. On the coldest of days it is so solid that it has sometimes been necessary to dig it out of the tanks. In the shipment of crude oil, expansion and contraction with changes in climate must be allowed for. It is also necessary to fit heating coils to keep the crude oil’s viscosity or “thickness” under control as far as possible. Lubricating oil is familiar to all car owners who buy oil of this type in sealed bottles. This oil is brought across the sea in tankers which may carry as many as twenty-seven different varieties or grades of oil. Many of these tankers' have vertical cylindrical tanks. Lubricating oil, a by-product of crude oil, is made sometimes in refineries at the wells and sometimes as far away from the source as Rouen, France, or other European centres. 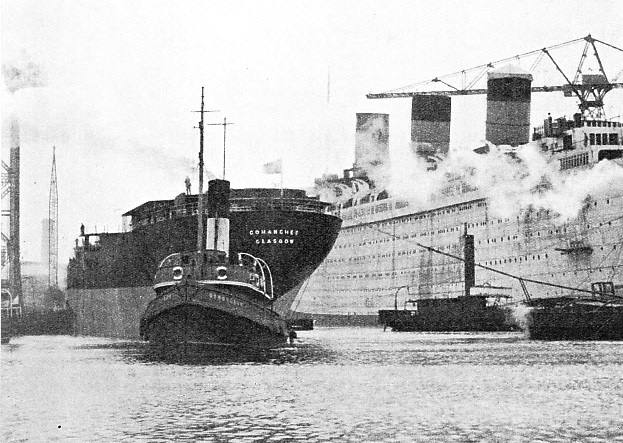 IN THE FITTING.OUT BASIN on the River Clyde where the Queen Mary was completed, special care had to be taken to prevent the newly-launched tanker Comanchee, 10,310 tons deadweight, from drifting into the giant liner. The Comanchee, 445 feet long, has been designed for carrying lubricating oil in bulk. Special ballast tanks were provided to hold 3,000 tons of ballast water, apart from the cargo tanks. Gasoline, petrol, or the other highly volatile derivatives of crude oil comprise the most difficult and dangerous cargoes of all. They are explosive, and a fire in a petrol-carrying ship is fatal. Even when a tank has been pumped dry and the air in it has been changed, there is the ever-present danger of a lurking gas pocket. Gasoline also has a corrosive effect upon steelwork and, up to the present, casinghead gasoline, as the strongest mixture is called, has defied nearly all attempts to produce an anti-fouling composition that will defeat its inroads. Casinghead gasoline wears out a ship’s hull in less than half her normal life of about twenty years. It is partly for this reason that about forty tankers, with a combined gross tonage of about 300,000, are under construction every quarter in the year. The tanker owner has tried to overcome this wastage in another way. In some instances he has scrapped the centre or tank portion of the ship, retained the stern with its machinery and the bow with its small dry-cargo hold and forecastle, and joined them up again to a new centre portion. It is, however, a better pro-position to build a completely new ship. At least one fine fleet of tankers is sometimes employed to transport molasses, or sugar syrup, from ports in the East Indies or in Cuba to industrial centres in Europe and the United States. Molasses is similar to thick crude oil and in construction molasses carriers and oil tankers are identical. There are many uses for tankers today. So fastidious has the modern motorist become that many ingredients are added to his petrol to give him a few more miles to the gallon. Some of these ingredients are gaseous in nature. They are carried under pressure in vertical cylinders. This cargo is difficult to manage, for if anything goes wrong with the pressure, the ship arrives in her home port without her cargo. A modern tanker’s hull is cellular in construction, and her machinery is aft. Between one or two pairs of divisions or bulkheads are situated powerful pumps. These send the liquid cargo along continuous fore-and-aft pipe lines on either side of the ship, and thence by vertical pipes to a similar system on the deck, where the liquid can be pumped overboard. If only one type of oil cargo were to be carried, the simplest form of tanker would be a decked-in tank with ship-shaped bow and stern and machinery in the rear. The main reason why this is not practicable, apart from the normal strength and safety considerations that govern the placing of bulkheads in is that the liquid would be uncontrollable in all but the flattest of calms. The movement of its free surface would be such as almost to capsize the ship when once it started to swing with excessive rolling in a transverse direction. idea. Transverse bulkheads can be easily arranged to suit the size and loading requirements of the ship. VARIOUS TYPES OF CARGO may be carried in modern tankers. Sugar syrup, or molasses, is brought to consuming countries from the East Indies and Cuba in tankers. The Athelknight, 8,940 tons gross, was built in 1930 for the United Molasses Co, Ltd. She is 475 feet in length; her machinery is placed aft and her officers’ accommodation amidships, as is usual in tankers. Tanker design has been evolved on the assumption that crude oil is to be carried. We have seen that crude oil varies in volume according to the temperature. Hence, above every main tank and all fore-and-aft tanks, additional tank space must be built and connected to the main tanks to allow for expansion in hot weather. This feature is known as the expansion trunk. The small high square tank hatches above the expansion trunk have vertical ladders leading down to the ship’s bottom. These ladders form the only means of access to the tanks for cleaning, painting and any other repairs that may be necessary. The cargo proper is loaded and unloaded through pipes by pumps situated on shore or aboard according to the port equipment and regulations. The regulations affecting tankers are strict, and do not always make for the comfort of officers and men on board. Most harbour authorities will not allow oil depots within several miles of their ordinary quays. Thameshaven, for instance, on the Essex shore of the Thames estuary, is one of the spirit depots of London. Saltend Jetty on the River Humber is some distance from the port of Hull. No light or power is allowed on a ship discharging gasoline, and for twenty-four hours or so the crew must often accommodate themselves ashore as best they may. The narrow expansion tank built up along the top of the main tanks has suggested to naval architects the possibility of using the space between the expansion trunk top and the ship’s side. This space can be made into another tank. A tank so arranged is known as a summertank. In modern tankers this is not now used universally, although it may fulfil an important function for carrying special oils. The machinery of a tanker is aft for two reasons. Machinery amidships would break up the tank space by the presence of the tunnel in which the propeller shaft works and this would also duplicate the expensive pumping machinery. In addition, the farther aft of and away from the oil cargo the machinery is, the less the risk of fire. All kinds of machinery are employed for propulsion - steam, diesel and electric. Welding is playing an increasingly important part in tanker construction because it permits strong joints to be made easily in portions of the ship’s structure that are rather inaccessible to riveters and caulkers. It may be that the all-welded tanker of 12,000 tons carrying capacity will be the streamlined express oil carrier of the future. We have spoken of the evolution of the bulk liquid carrier. For the earliest information we can go back to Chinese history. There are records of a Newchwang junk specially caulked and fitted with internal divisions to carry water in bulk. Originally built at the beginning of the eighteenth century, these junks were later used for petroleum. They had a capacity of about fifty tons. The cross-section of this type of junk bears a marked resemblance to that of the modem tank vessel. The junk was provided with a trunk for the expansion and contraction of the liquid cargo and to keep the main hold always full. The Newchwang junk did not have a centreline division, but her main hold was divided by transverse bulkheads. Petroleum was carried also dowTn the River Irrawaddy from the hand-dug wells of Burma in the holds of the native sailing-boats to Rangoon for refining. These sailing craft appear to have been used for that purpose until after the advent of the Burmah Oil Company. Early in 1795 a Mr. Gibson of the Isle of Man had the Ramsey, an iron sailing tank vessel, built to carry oil. The cargo space was divided into compartments by a centre line and several ’thwartship bulkheads. Since they were completely filled and were air-tight, there was no wash. The vessel was fitted with a patent expansion device. In the nineteenth century Rogerson & Sons, of New castle, with an American railway company, formed the Petroleum Trading Company for the express purpose of importing oil into Europe in specially built iron tank vessels. A few months later they built the Atlantic, followed by the Great Western, either vessel holding about 700 tons of oil in eight tanks. These vessels were provided with transverse and central longitudinal bulkheads; expansion was controlled by the fore and main masts, which were of hollow iron construction. The ships were evidently the first to carry their own pumps. 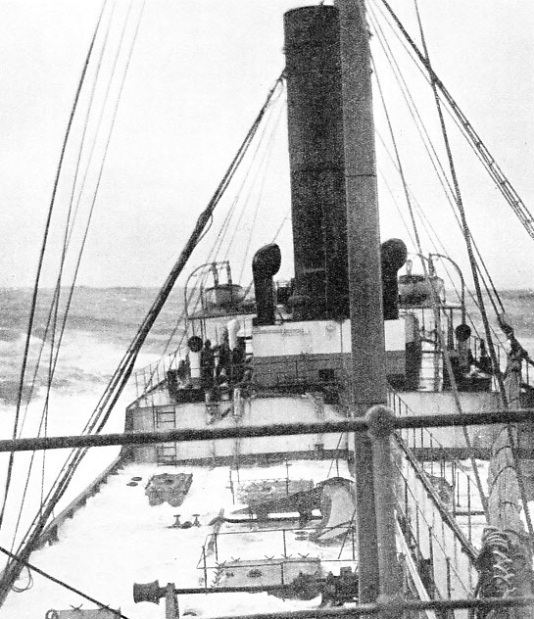 The Atlantic was wrecked after about six years, but the Great Western operated until 1896, when she was abandoned at sea. The Charles was a later ship fitted with iron tanks for oil carriage. The tanks were built to fit the interior moulding of the ship, and were worked on the separate tank system without pipe connexions. Her total capacity was 794 tons. She operated from 1869 to 1872, carrying crude oil from the USA to European ports. She was destroyed by fire in 1872. Russia was one of the earliest commercial sources of oil, and much money was spent by the Nobel Brothers in developing suitable craft to carry crude oil on the River Volga and on the Caspian Sea. Oil in barrels, known as case oil, was early in the present century carried in sailing ships, some of them specially adapted. The history of sailing oil-tankers forms a unique chapter in the history of wind-driven vessels. British shipbuilders were watching the growth of demand for this new product and were building craft of more or less experimental type with tanks shaped to the ship’s hull and built with the hull. It was not until some little time later that it was realized that the tank ship was a floating tank with propulsive power and that the liquid cargo should rest directly on the skin of the ship. One man who has perhaps done more than anyone else to bring the tanker to its present state of perfection is Sir Joseph W. Isherwood. He patented the Isherwood longitudinal system of framing, to be applied to all ships, but in particular to tankers. Although this system was followed by a number of modifications, it is to-day the arrangement of hull constructional members upon which the majority of the world’s tankers are built. To appreciate the characteristics of this system of framing, we must realize that cargo ships are composed of transverse vertical ribs known as frames. Longitudinal strength is contributed by horizontal girders, by stringers and by the double bottom. A s the oil cargo rested directly upon the skin of the ship, Isherwood realized that a tanker needed longitudinal strength above all other constructional attributes. The ordinary ship has narrowly spaced transverse frames and widely separated longitudinal girders. The Isherwood vessel has widely spaced deep vertical structures or “ frames ” between the numerous tank bulkheads, and also narrowly spaced longitudinal girders, whose scantling or size is no greater than that of the normal transverse frames. A ship thus built is able to withstand enormous shear forces - forces that tend to tear the ship into sections in a vertical direction - such as would be set up if some tanks were full and others empty. There are hundreds ot tankers busy on the Seven Seas of the world. Most of them are either big vessels carrying from 10,000 to 12,000 tons, or small coaster types carrying 1,000 tons down to about 250 tons. The big ships are owned by the major oil companies, such as the Anglo-Saxon Petroleum Company, or the Standard Oil Company groups, or they are of tramp type Norwegian-owned, and hired out by the voyage or by the year, or even for five years, to the oil companies. A typical large tanker has a deadweight tonnage of 17,650 and a gross tonnage of 12,097. Her dimensions are 521 feet long between perpendiculars, a beam of 70 ft 3 in and a depth of 38 ft 9 in. She draws when fully laden 30 ft 6 in, and her speed of 11½ knots maximum requires two screws with a total of 4,700 brake horse-power. THE SEAS RECEDING from the low amidships deck of the oil-tanker F. A. Tamplin. This photograph, taken in 1913, shows the typical structure of an oil-tanker of that time. The F. A. Tamplin was a tanker of 4,004 tons gross. The average life of a tanker which carries gasoline is under ten years. About forty new tankers are built every quarter.